Be the first to rate this drive! Theodore Roosevelt National Park is a testament to the legacy of Theodore Roosevelt who in his presidency, helped established 230 million acres of public lands. A staunch proponent of conservation and preservation of our natural resources, today you can explore and admire a landscape virtually untouched by humans. This scenic drive travels through the North Unit of Theodore National Park. 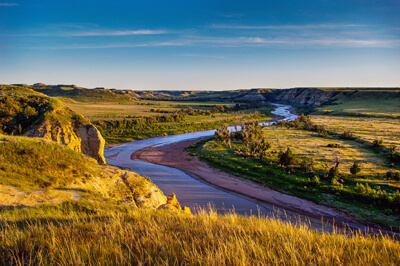 The park is out of the way, but if you want to experience the badlands of North Dakota, and one of the most diverse prairie ecosystems on the planet, it is more than well-worth the visit. Hiking or walking amid striking topography and unique rock formations along with wildlife watching for bison, elk, and prairie dogs make this park special. There is a fee to enter or use your America The Beautiful Annual Pass. Note there are three sections to Theodore National Park that are not connected. South Unit of Theodore National Park is 70 miles south and easily accessed off I-94 in Medora. The Elkhorn Ranch Unit is in between the North and South units with access via gravel roads. Our scenic drive begins at the North Unit of Theodore National Park Visitor Center off US-85, south of Watford City. The drive does not loop or exit at the other end, so you will need to backtrack to exit, making it a total of 28-miles. Services are limited, bring food and water, and as we recommend for all road trips, begin with a full tank of gas. The drive itself is short, leaving a lot of time to get out and explore on the trails, viewpoints. pullouts, and overlooks. Not-to-be missed is the Cannonball Concretions Pullout (V1). Created by erosion, the large spherical boulders are a peculiar contrast to the surrounding jagged geology. Stay overnight at the Juniper Campground (A1) which offers 50 sites open year-round, first-come, first-served. There is also one group site that can be reserved. Enjoy a variety of educational ranger programs and hikes. At night, the skies dazzle with stars, the milky way, and aurora borealis. Mid-July is host to an annual Badlands Star Party. Check the website for dates. Pick up a pamphlet for the 1.6-mile round trip guided section of the Caprock Coulee Nature Trail (H2) which examines the extraordinary plants and grasses, wildlife, geology and history of the rock formations. Up for more? The trail continues, making a 4.3-mile loop through diverse landscape of coulees, forest, mixed-grass prairie, interesting hoodoos, and caprocks. Don’t miss the easy 1.5-mile round trip section of the Buckhorn Trail which begins at Caprock Coulee Trailhead and heads to Prairie Dog Town. Get ready to photograph prairie dogs, the cutest burrowing rodents ever, bison, and other wildlife. The entire Buckhorn Trail (H1) loop is 11-miles. You can also begin near the Visitor Center. The drive ends at Oxbow Overlook (V2) with expansive views of the Badlands and the Little Missouri River. Hike to Sperati Point along the Achenbach Trail which is a 1.5-miles round-trip. The full loop of the Achenbach Trail is 18-miles and considered beautiful, but strenuous. To exit the park you have to backtrack, taking in some last photographs and walks along the way.